But referrals aren’t under your control: you can offer incentives to your customers to provide you with referrals but whether they do so or not is totally up to them. Inbound marketing, a plastic surgery lead generation strategy that uses informative content such as blog posts, videos, ebooks, case studies, etc. to attract prospects to you, allows you to provide the type of information your potential customers are looking for (information about the cost of plastic surgery procedures, what to expect before during and after a procedure, potential results, etc.) where they want to receive it (online and via e-mail) and – most importantly – when they want it, allowing them to read or watch it at a time that’s best for them. And they will read/watch it! We know this because plastic surgery prospects are hungry for information. They understand how important choosing the right surgeon is and so they carefully consider as much information as they can before making a decision. The information you provide them helps them look to you more and more as they progress through each stage of their buyer’s journey. 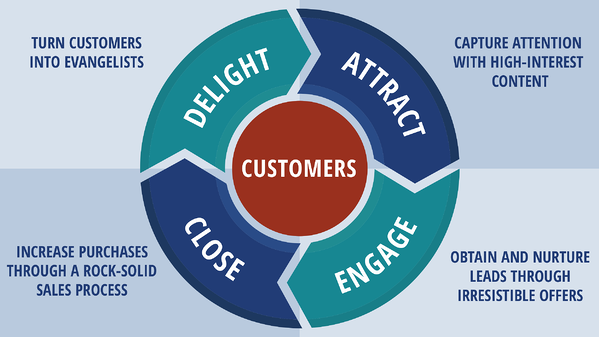 As shown in the graphic below, the inbound methodology consists of four steps when marketing to your prospects: attracting, converting, closing, and delighting them. Attract: Your prospects start out as strangers. Using keywords you know they are using to search for plastic surgery services, you produce content that answers their questions/gives them the information they seek, and then broadcast your posts via your social media channels so that they will see them and visit your your website. Convert: Now that prospects have visited your site, you offer valuable free downloads of ebooks, case studies, white papers, etc. so that visitors will give you their contact information. You capture this information via forms visitors must fill out to get the free information. These forms are located on landing pages, linked to from calls-to-action in blog posts and key web pages on your site. Close: Once a visitor has given you her contact information, she is now a lead. You continue to court her with valuable free information via your blog posts and e-books, but you also now send her e-mail messages filled with even more well-researched information she can use as she makes her buying decision. After having nurtured your relationship with your prospect so much, she will likely choose you to do her procedure. Delight: Once she’s a customer/patient, you continue to delight her with valuable content. She will return to you for additional procedures – she’s now a customer for life – and she will tell her friends about you: she becomes a promoter for you, bringing you valuable referrals. Inbound marketing results in some incredible lead generation results. How incredible? HubSpot, which created a terrific inbound marketing software platform (one we use here at ClearPivot for our clients), has found that following the inbound process results in 4.1 times more website visitors within a year, as well as 3 times the number of leads within that year. What’s more, these are highly targeted leads because a modern inbound strategies requires that you identify who your perfect prospect is so that you can create the kind of content she not only wants and needs, but is most likely to read or watch. So what do you do with these leads once you have them? Continue on keeping on. That is, you continue to provide them with information as they move from sales funnel to sales funnel, keeping in mind that the content will be different depending where they are on their buy buyer’s journey (top of funnel, middle of funnel, etc.). And Inbound is an Effective Plastic Surgery Lead Generation Strategy Because…..? Using inbound marketing for lead generation absolutely, positively, definitely, no doubt about it will result in turning highly qualified prospects into clients because…. (drumroll)…. You’ve provided them with well-researched information they needed when they needed it. You are the expert. You are the surgeon who took the time to educate them thoroughly. You didn’t try to sell them on anything; there was no pressure coming from you. You are the professional they know and trust. They want you. Not your competitors.